For over 30 years, the monks and nuns of International Mahayana Institute (IMI) have tirelessly helped bring the Buddha’s teachings to the far corners of this planet. 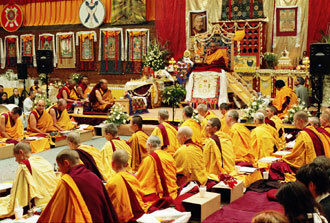 Today, approximately 280 monks and nuns continue to serve as teachers, retreat leaders, directors, spiritual program coordinators, editors and counselors in FPMT centers, projects and services worldwide. If you would like to support the IMI community, you can donate to the Lama Yeshe Sangha Fund online via our secure server.